j-na collection haute couture 2012 Spring Summer! j-na Collection Haute Couture Spring Summer Launch! Finally a couture collection that is all about comfort, variety and extravagance! Collection Haute Couture with new concepts years in the making. The j-na couture fashion accessories line of exclusive of totally unique handmade luxury designs, in years of planning and development of this concept will now be releasing the j-na couture 2012 Spring/Summer collection haute couture. 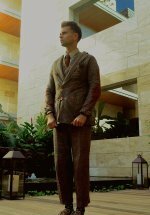 "I am just ecstatic to release a full line of haute couture that signifies the special unique qualities of each person and their yearning to display their personality and true-self with pride through luxury always exclusive high-end mediums," says J-na, chief designer and president. The collection is all about comfort with yacht club and beach resort themed, made-up of two and three-piece couture day or night dresses, flowing beautiful evening skirts that double as full beach cover ups, wide leg lace pants, couture interchangeable separates, sheer couture beach cover ups, and couture sarongs. The collection stays true to the j-na principles for her brand of accessories, everything detailed and handmade, exclusive all original, interchangeable and with multi-functionality, real jewelry and gemstone adornment options, with an importance on handknit texturally rich fabrics in compassion natural fur fibers, and silks. The essence of the "all green" and eco friendly fashions! All of couture model designs are complimented indeed by the latest sets in accessories! Couture bags with detachable jewelry sets, headpieces, and jewelry. For years Jena has been a creative women's advocate, communicating her passions through motivational speaking, volunteer work, her extravagant fashion designs, and even textile art. Portray the authentic self of the individual. Within the reach of more than just the mega-rich! "We are so excited to be blessed in serving women empowering them develop by revealing their true couture self-concept, introducing them to the wonders in couture living!" j-na 2012 sari with fur, silk, and jewelry adornments. j-na couture jewelry 2012 resort. j-na couture zebra print wrap skirt summer 2012 resort with hematite magnet and pearl belt/necklace. j-na beach cover up in rosed lace, navy and gold fur fringed with magnetic buttons. j-na resort 2012. Two-piece beach day dress j-na couture 2012 summer. j-na beach sarong with shell adornment. j-na couture 2012 skirt semi-sheer doubles as flowing sun-dress. Resort 2012. Sheer beach cover up dress resort 2012 j-na couture. j-na 2012 spring summer handbag animal print. Return to see more extravagant haute couture j-na collections and develop your best couture concept in couture living by exposure to more totally original design concepts and options or your priceless couture garments! Not as advanced of a couture student? Go back to homepage for Couture History 101!